Nothing to pay if you lose. Free legal advice from a friendly solicitor. How Much Compensation Can I Claim For A Crane Accident? Cranes are a major part of the construction industry and are employed for a range of activities including lifting machinery, equipment, and materials. Cranes are used extensively on large construction sites and even small construction sites frequently need them. Despites modern safety standards and practices, cranes are potentially dangerous and pose potential risks to both the crane operators and other construction workers resulting in crane injuries and fatalities. There is a wide range of accidents associated with cranes, but the more common are: contacting live power lines and other overhead crane injuries; dropping heavy items; crane toppling due to human error, crane imbalance and lifting over-heavy weights; and accidents caused by the swinging hook. In almost every case, crane operator injuries and other crane accident accidents occur because of human negligence or a failure of the plant. Crane injury law sets out rules and regulations that are designed to eliminate or at least minimise all these risks. For instance, prior to any work being carried out risks to everyone on the site should be assessed through a formal rick assessment. All dangerous structures such as power lines should be identified and plans laid down to minimise the potential risk. All crane operators and people participating in the lifting operation must be fully trained and other site workers should be trained in the risks associated with working close to a crane. It is the ultimate responsibility of the employer that all cranes used on site are maintained in safe working order and are inspected regularly with proper maintenance schedules to protect the safety all site workers and visitors. Failure to do so could result in serious charges including corporate manslaughter. If you have been injured by an accident involving a crane, you may well be able to claim compensation. If we can be shown that the accident was not entirely your fault and was due to plant failure or negligence there is a good chance your claim will be successful. We have produced this guide to help to understand the implications of crane injuries and how you can approach making a successful claim injury claim. It is important to note that personal injury claims must be made within three years, but you should seek advice on making a claim as soon as possible. A guide to crane accident Claims. What is a crane accident? Have you been injured in a crane accident? What should you do if you have been injured in a crane accident? Can you sue for crane injuries death? Death due to a crane accident can I claim? What can I claim for after a crane accident injury? What to do if you have been involved in a crane accident? Can I claim if a family member has been in a fatal crane accident resulting in death? The long-term effects of a crane injury? Can I claim for PTSD after a crane accident? Who can claim for a crane accident injury? How Much Compensation Can I Claim for crane accident claims? No win no fee crane accident compensation claims. Who can you sue for a fatal crane accident on the behalf of the deceased? Have you been injured whilst operating a mobile crane? What can I claim for in a fatal crane accident resulting in death? What kinds of evidence do you need to make a crane accident claim? Examples of how crane accidents happen. How do crane accidents occur? How to start your crane accident claim. Why choose us for your crane accident claims service? Call for free advice and to start a claim. Modern working practices and HSE (Health and Safety Executive) regulations have reduced crane accidents substantially and fatal crane accidents are now quite rare, typically no more the one or two a year; but they still happen. As crane accidents involve heavy machinery and heavy loads, when they do occur they tend to be severe While most crane related injuries occur at construction sites, cranes are also employed in other hazardous environments such as oil rigs, shipping, and energy plants. By law, employers must ensure that all the required safety measures are fully implemented to reduce danger and minimise the possibility of an accident. This applies not only to workers operating or being involved with the crane operation, but all other workers on the site. Workers and site visitors must wear protective head and footwear along with high visibility jackets. It is also the responsibility of the employer to ensure that the crane and all related equipment is mechanically sound and safe to use in its environment. There must be a regular maintenance programme in place and the plant must be inspected on a regular basis. This might include weekly or even daily checks depending on circumstances. Only fully trained and qualified workers should be allowed to operate the crane and to work on crane related operations such as loading and unloading. All workers involved in the site and who work within the vicinity of the crane should receive adequate training and adhere to stipulated work practices. Prior to any work commencing, it is the responsibility of the employer to ensure that a full safety assessment is carried out. This must take into consideration the environment, for instance the wind level, ground condition, temperature, and so forth. If your employer fails in any extend in any of these areas and as a result you are injured, then you entitled to claim compensation and if it can be shown that your employer has in any way been negligent, you have a very high chance of winning your claim. If you have received any crane injury even if you are not sure that your employer is to blame, it is important that you report it to your employer as soon as you are able to do so. You should also speak to an expert in crane compensation claims who will be able to assess whether you have a strong case for making a claim. Ideally you should do this at your earliest opportunity while everything is fresh in your mind, though even if the accident occurred some time ago, if you initiate your claim within three years of the accident you are still entitled to claim compensation. A crane accident is defined as any work-related accident that involves a crane of any kind. For instance, a mobile tower crane, a midsize large all terrain crane, or a static crane. It might happen to a crane operator, members of the crew involved in loading and unloading the crane, other workers on the site who are injured by one of the heavy cranes or by a load being moved by the crane, site visitors and managers, and the public who might just be passing by the site. Colliding with overhead power line. Colliding with other high objects and buildings. A crawler crane accident cause by two cranes colliding. The crane loses its load which falls to the ground. The crane hook swings causing injury. The crane is unbalanced and topples. An attempt to lift Two heavy a load destabilises the crane. Mistakes are made while loading or unloading the crane. A sudden gust of wind destabilises the load. Ground subsidence or improperly supported crane. 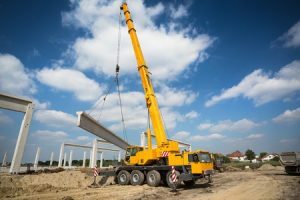 If you have been injured in a crane accident within the last three years, you may be entitled to compensation, particularly if the accident was at least partially due to plant failure of negligence by your employer or by a co-worker or manager. Even if you think the injury was your own fault, you might still be able to make a claim for contributory negligence. If you have been injured in a crane accident, it is vitally important that you report it to your employer at the first available opportunity. Your employer must by law have an official procedure for reporting crane accidents and you should ensure that you follow it explicitly. You should also visit your doctor or A&E department as soon as you are able and ensure that the full details of the injury are entered into your medical records. If you attend A&E, you should also ensure you subsequently visit your GP. A problem with our overstretched A&E departments is that they often fail to record the full details of such injuries, so always back it up with a visit to your GP. According to the latest overhead crane injury statistics, crane injury deaths are now uncommon, with just one or two happening each year, they still do occur and often with devastating consequences to the victim’s family. If your spouse, partner, or other close family member has died as the result of a crane accident, you are entitled to sue the employer if the crane injuries death was immediate, or if death occurred days, weeks or months later. Losing a close family member as the result of a crane accident is a devastating experience and if the victim was an important breadwinner for the household there are also likely to be severe financial consequences too. Certainly, you can claim, and if the death was wholly or in part due to the negligence of the employer your claim could be substantial. It is important that you contact a crane accident compensation solicitor as soon as possible to discuss your situation and assess how much you might be able to claim. Permanent damage or loss of limbs including fingers and toes. Loss of sight or impaired vision in one or both eyes. Psychological problems because of the injury such as PTSD. Knowing what to do if you have been involved in a crane accident isn’t always obvious and you might find different people offering different advice, which can get confusing. These are the most important actions you should take and you should ensure that you carry them all out, preferably in order. Immediately report the injury to your line manager or foreman. Ensure that you receive immediate treatment for your injury. If it is minor, then your local first aid worker could assess the injury and apply first aid. If it is major and you require emergency treatment by paramedics make sure that somebody informs your family or friends about your injury. Always get your injury checked over by your A&E department or by your GP. If you visit the A&E first, also get it checked over by your local GP as A&E departments won’t necessarily keep detailed medical notes on your injury. As soon as possible complete a full accident report at your workplace. Keep detailed notes on exactly how the accident happened and the names and addresses of any witnesses. Check if you are entitled to compensation by contacting an expert crane accidents compensation solicitor. If a family member has died in a fatal crane accident, you may be able to claim compensation. If you are the spouse or partner of the deceased, then you might be able to claim for both the pain of the bereavement, cost associated with the bereavement such as funeral expenses, and if the deceased was an important breadwinner in your household you should be able to claim for the loss of their earnings over what would have remained of their lifetime. As cranes are such heavy plant and carry enormous loads, crane injuries are often severe and can result in long term trauma both physical and mental. At the worst end of the spectrum, brain injuries might result in permanent coma such as a persistent vegetative state. Fortunately, that is rare, though even less severe head and spinal injuries can lead to paralysis or partial paralysis. Broken bones are a frequent result of crane injuries, and although broken bones do mend often they leave behind some level of long term disability or pain. Certainly, it can take months or even years of physiotherapy to regain the movement and strength you had prior to the injury. Recurring injuries can also be triggered by an initial crane injury. Typical of this are back injuries which never seem to quite go away. Crane injuries can also have psychological effects, PTSD (Post Traumatic Stress Disorder) being typical. This can result in nightmarish memories of the incident that can include a wide range of psychological effects such as depression, anxiety, and phobias. It isn’t unusual for crane accidents to cause PTSD and if you are a victim of this you should be able to claim compensation if the accident was the result of negligence by somebody other than you, for instance your employer or co-worker. PTSD can have a life devastating effect and may take years of therapy to recover, and the amount you are able to claim will take this into consideration. If you are wondering can you sue for crane injuries, any person who has sustained a crane accident injury that wasn’t entirely their fault can lodge a claim. It is essential that the cause of the injury was to at least some extent the result of negligence on the part of the employer or equipment failure which also implies employer negligence as it is the responsibility of your employer to ensure all equipment is safe. If you have followed the stipulated working practice, worn the proper safety gear, and followed instructions given by your boss, then you are likely to have a valid claim. 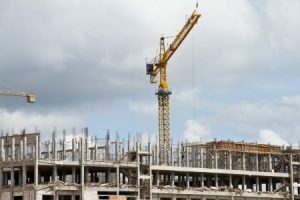 There are no set sums for damages for crane injuries; it all depends on how the court views your loss in terms of monetary loss including loss of earnings and other costs, however there are some official guidelines. Also, you should expect to be compensated for any pain and suffering you have endured. The court also has the power to impose punitive costs to your employer, which could vastly increase your total compensation. If you are claiming compensation for the loss of a breadwinner, for instance your spouse or partner, the court may take into consideration the loss of earnings potential over the breadwinner’s lifetime. Crane injury long term effects such as PTSD and loss of mobility are also covered. Here we have provided some examples taken from real life cases and official court guidelines. However, you might be entitled to considerably more than this, depending on circumstances. To an extent this will depend on how effectively your solicitor presents your case. Death Compensation Typically, £200,000 or more. Recently the wife of a laborer was awarded £352,000 for the death of her husband who was crushed by heavy machinery. They have four dependent children. Such settlements are typical of death by crane lawsuit settlements. Funeral costs Typically, up to £10,000 This might be paid in addition to other claims. Bereavement Loss £12,980 This is payable to close family members as compensation for the loss of their family member. 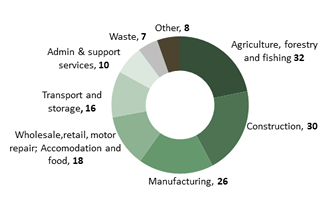 The amount is per family and is shared between beneficiaries. Face injuries without permanent disfigurement £1,800 to £11,800 Typical injuries could include broken cheek bones, nose, and broken jaw. If you have sustained a crane injury because of the negligence of somebody else, the sensible route to take is a no win no fee crane accident claim. It your claim is successful you will be covered for all financial losses including loss of earnings and medical costs and you will pay only an agreed percentage of your award towards your legal costs. If for any reason your claim is unsuccessful, you will owe nothing at all. All costs will be borne by your solicitor. For most people, a no win no fee compensation claim is their only chance of receiving proper compensation for their crane injury. If you wish to sue for a fatal crane accident on behalf of the deceased, then you will sue the deceased’s employer. By law all employers must carry insurance that will cover them for such claims, so even if the deceased worked for a small business, there should be funds available to pay out the claim. If you have been injured whilst operating a mobile claim, you should consider who was at fault. If it was entirely your error, for instance you didn’t follow the proper protocols, you broke the rules, or you were just negligent, then while you have our sympathies unfortunately it is unlikely that any claim would fail. But, if the mobile crane accident was the result of somebody else’s negligence, then you might be able to claim compensation. Fatal crane accidents are fortunately quite rare these days, but they do happen at the rate of one or two a year. If you are unfortunate enough to have lost a close family member in such an accident and the accident was the result of somebody other than the deceased’s negligence, you should be able to make a claim. If you are claiming for bereavement, then you can claim from £12,980 to £300,000 or even higher with extras included. Plus many extras to be shared between close family members. But if the deceased was a breadwinner, then you can claim for their loss of potential earnings which could be perhaps around £300,000. For more information on death compensation claims visit this link. To explore your options, please speak to a crane accident compensation solicitor. According to HSE statistics there’s been 61 tower crane accidents since 2001 where 9 people have lost their life and 25 people have suffered serious injury. Photographic evidence of your injuries. Witness statements and/or CCTV footage. Information on your training prior to using or working with the crane. Receipts for all out of pocket expenses relating to the accident, for example medications, transport, and medications. An account on how the accident has disrupted your normal life, for example has your mobility been affected, are every day activates more difficult to carry out. The crane topples or collapses. The crane hits an overhead power line. The crane loses part of all its load which injures people positioned below. The moving crane load hits somebody. The accident is the result of mechanical failure. Mini crane accident results from two cranes colliding. Mostly crane accidents result directly from the negligence of the crane operator or insufficient training and experience. 90% of all crane accidents result from human error. 80% of incidents involving cranes toppling are due to operators lifting loads greater than the plant’s operational capability. 54% of crane accidents result from lifting or swinging the boom when the outriggers aren’t fully extended. 45% accidents involving mobile cranes are electrocution because of contact with a power source according to overhead crane injury statistics. 40% the crane accident victims were injured by being hit with an improperly controlled hoisted load, crane hook or other crane part. 80 workers a year who work with lift and material handling equipment have fatal accidents. It isn’t just workers who lose their lives or receive serious injuries, passersby and bystanders are also injured or lose their lives due to accidents with overhead and mobile cranes. Contact us today and get free legal advice you can either contact us vie phone, Live chat, Contact form, or start your claim with our online button. We have extensive experience of crane injury court cases resulting in substantial compensation for our clients. We are dedicated to ensure that every client receives the best legal advice and representation available no matter what their financial position might be. Client needs are the focus of all we do. Rest assured that every aspect of your claim will be considered in detail and no stone will be left unturned. We will look at every angle to ensure you receive the best possible outcome for your claim. Ultimately our goal is to seek the best settlement for each and every client; a goal that we continually achieve. Choosing us to represent your crane accident claim is an excellent decision you will be pleased you made. Whether you wish to claim for a crane accident you sustained personally or you are claiming on behalf of a family member, then the best way to stat is to give us a call on 0800 073 8804. We will quickly assess your case and provide free legal advice on your next stage. Be assured that no matter what the final outcome may be, you will never be out of pocket; any legal fees will be paid out as a fraction of your successful claim. Fatal injuries arising from accidents at work in Great Britain: Headline results 2016/17 – This link provides the latest figures on work related fatal injuries. 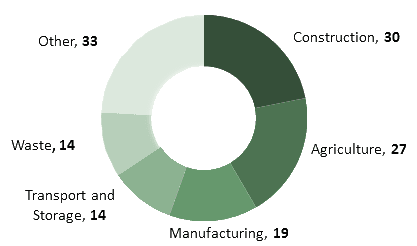 Although there is overall downward trend, during 2016/17 137 workers were killed. The link breaks this down into the main types of accident, all six of which could be caused by a crane accident. How Much Compensation for An Accident at Work Claim? – 2017-Update – this provides a detailed guide on the amount of compensation you might be entitled to for any specified work-related injury. Bereavement – coping with bereavement is one of the greatest challenges any of us have to endure and most of us need help to get through it. This link provides guidance on where we might find the help and support we need at such critical times. Post-traumatic stress disorder (PTSD) – work related accidents such as crane injuries frequently result in PTSD. This link describes the typical PTSD symptoms and can help you tell if you are suffering from the condition and when you should seek medical advice.